This is my entry for the latest challenge from Bah Humbug, 'All that glitters'. The image is stamped in black and then glittered using my Quickie Glue Pen and some ultrafine glamour dust. I have inked the edges of the card with worn lipstick and peeled paint distress inks. The papers are I think Fancy Pants from last year. Wow this is just gorgeous - love that tree so unusual. Thanks for joining in again and how lovely to see you displaying our loyalty badge. Your card is stunning - love it. Gorgeous colours and fabby tree. Thank you so much for joinng in our challange at Bah!Humbug! and displaying our Loyalty Badge. Wow! 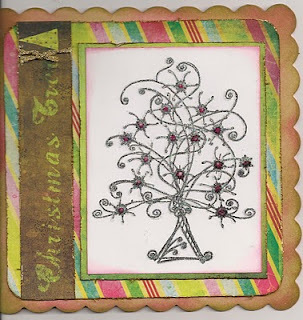 Super tree stamp - must keep an eye out for that one. Love how you have followed the stamped image and added your sparkles. Luvverly result. Thanks for joining in with us at Bah! Humbug! and hope you will become a regular visitor.